Now in its 15th year since release, the Lexus RX 450h continues a fine tradition in the Lexus lineup with this crossover vehicle ready for city highways, interstate travels and even mountain passes, providing power and performance plus fuel efficiency to boot. The hybrid version of the Lexus RX has been a favorite ever since we first drove the 2005 RX 400h in 2004. It struck us as a right-sized and well-powered small SUV with excellent versatility and surprising economy. The current incarnation of the 2013 RX 450h not only continues this proud tradition, but also raises the bar others must compete with to a great degree – something the fourth generation will surely repeat when it is released in the next year or so. The Lexus Spindle grille nestles between the complimentary angled front light clusters like it has found its niche in today’s complex world. Auto-dimming, self-cleaning headlamps align over LED running lamps and integrated fog lamps are placed just above the sculpted bumper. From the side, the graceful lines of the RX 450h make clear its shape is designed to move air over, around and under the vehicle with as little resistance as possible. Chrome accents run beneath the doors with the proud Hybrid badge clearly visible. On top, shiny roof rails echo the arc of the roofline, swept back into an extension functioning as a spoiler, allowing the air flowing down over the Lexus to help push it forward. The 19-inch alloy wheels are part of the optional Luxury Package, and 18-inch aluminum alloy wheels are standard. From the driver’s seat, the interior ambience is almost as ensconcing as a top of the line Range Rover, in a vehicle costing not only less to purchase, but also less to operate, thanks to its remarkable efficiency. The leather, wood and metal accents are tastefully repeated throughout the interior – the large widescreen navigation and information display is echoed by the DVD entertainment system in the back of the front headrests. One touch opens the power moonroof to the let the wonder of the outside world come in, when such moments come around. Whether a short commute or an extended journey, the soundtrack of your life plays over a Mark Levinson Premium Surround Sound systems with 15 speakers, HD radio and iTunes Tagging along with a lot more good stuff. Any vehicular or other data you may need is readily customizable for quick reference on the Lexus Multi-information display, further enhanced by the apps in the Lexus Enform suite, plus Navigation with Voice command, destination assistance, and eDestination capability. Sirius XM weather and traffic updates are complimentary for the first three months of ownership. Lexus was recently rated the top automaker for fewest new owner complaints. Add to that accolade the fact they have become among the safest vehicles on the road today. The NHTSA has rated the 2013 Lexus RX 450h with an overall score of 5 stars, repeated in side impacts and rating 4 stars in frontal impacts and rollover events. This safety begins with on demand all-wheel-drive, all-season tires, and front and rear ventilated disc brakes. It continues on through the standard host of braking and stability programs, augmented by blind spot monitoring, a rear view camera, the proprietary pre-collision system and Smart Stop Technology - which means the RX would not run away with you even if it wanted to. Safety continues the through the vehicle via energy managing crumple zones, side door beam reinforcements, and security is enhanced with a theft deterrent system and engine immobilizer. Personal security is provided by the Smart Access Passive Entry System and Lexus Insider options that let you set which lights come on when you approach the car and for how long. When the key is in your pocket or purse, the car unlocks as you approach it and you can set it to open just the driver’s door or all doors to preference. When you exit you simply pass a finger over a depression in the door handle and the car locks securely. If that’s not yet enough, the RX 450h provides Safety Connect, immediate collision notification, vehicle GPS locator, Emergency Services Button and a year’s worth of Roadside Assistance. Last but certainly not least is radar adaptive cruise control. Thanks to the leading authority in hybrid technology, the 2013 Lexus RS 450 gets a fairly amazing 30-mpg in town and 28 on the open road, giving this right sized crossover a combined rating of 29-mpg. On top of that, it has a greenhouse rating of 8 and a smog coefficient of 7, making it one of the most environmentally friendliest large vehicles on the road. We had the opportunity to drive the 2013 RX 450h during one of the last late spring snowstorms in Denver and it performed elegantly in wet, slushy snow, accelerating without hesitation and stopping in surprisingly short stretches of slippery pavement when called upon to do so. In driving about the city and into the foothills over a week, all we really noticed was its ready power. Electric motors front and back plus a 3.5-liter, 24-valve DOHC V6 gas engine provide this. The combined power is channeled through an electronically controlled continuously controlled variable transmission. Sometime CVTs can seem soft and listless, but we would never have even suspected the Lexus had one had we not read it in the Monroney. It also features scuff plates if you want to take it on forest service roads, but unfortunately we did not get the opportunity to take the crossover off the pavement. All in all, it served to confirm our initial impressions that this is the ultimate combination of SUV and hybrid – if we were personally to by any SUV or crossover on the market, this would be our first preference, regardless of cost. The 2013 RX 450h has a starting price of $47,310, but the model we tested had over $16 in options that would be hard to live without had one ever become accustomed to them. With destination charges the total price came to $64,339. We’ve drove last year’s Range Rover HSE and at the time believed we had found the place we wanted to live, understanding why they are used to protect the Queen. 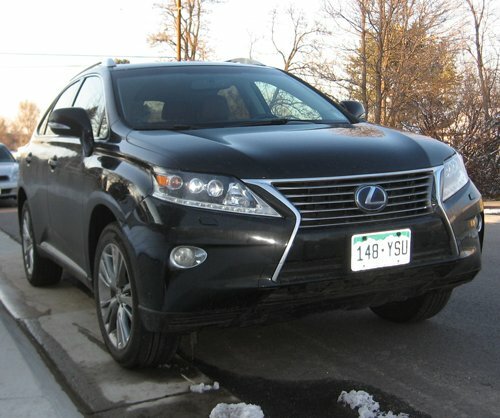 Nevertheless, the 2013 Lexus RX 450h provides a great deal of what the Range Rover supplies at a price of roughly $80K. At this point it comes down to personal taste, but we could be pretty happy with a new Lexus RX and $16K still in our pocket. In all truth, we’d be just as happy with the HSE, as long as we had the $16k left. That, in a nutshell, is the crux of the biscuit.